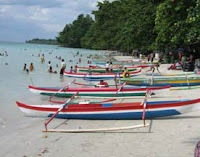 As capital city of Maluku-East Indonesia, Ambon is very well known for its white sand beaches. More over because most of those coast line always visited by fish boat from morning till the end of the day to sell their catching. On of the beautiful beach is Natsepa beach, located at Suli village, Salahutu, Center Maluku. 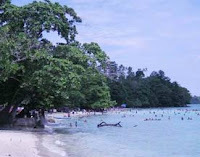 This beach was so famous for its white sand, suitable for play, sunbath, swimming and other beach activity. Ambon’s people said, you never go to Ambon if you never go to Natsepa beach. Access to reach this beach is so easy. From Besar station at Ambon city, you can ride public transportation to Suli for about Rp 5,000. You’ll arrive to Natsepa beach for the next half hour. Those Public transportations were start operation at 05.00-07.00 WIT (local time). If you use private transportation, only need 20 minutes from Ambon, about 18 km from down town. Ticket to enter this place is Rp 1,000/man and the parking cost is Rp 2,500/car and Rp 1,500/motorcycle. At daylight, you’ll not able to hold to swim to the beach. It is clear and has small wave. At afternoon, when the water get high, many visitors rent boat to travel through the coast line and see many workers carry plywood to go to Tripleks Batu Gong factory (plywood factory), located across the Natsepa beach. Cost for rent boat was Rp 20,000 for one hour. This boat can be ride for 10-15 persons. As the story goes, if you submerged for more than one hour at Natsepa beach, surely, when go back home, all your pain and disease will be gone with the Natsepa’s wave. Believe it or not, my self do the same experience, when I got flu and high fever when I visit Ambon at last December. Even my temperature was so high (390 C) and trembling, I coerce myself to submerged for about 1.5 hour, while pray to God really cures me. And it was like a miracle, when I finish and dry myself, I fell great, not feel trembling anymore. After swim and walking around the beach, you can relax at the small tent at the side of the beach. 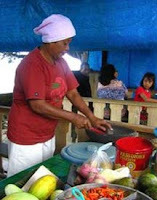 You can order fried banana, tuber, fried cassava, sweet coconut, or Natsepa’s rujak which famous with its peanuts spices. The rujak is costs about Rp 5,000. Those fresh fruits came from Suli village. Don’t get rush to go home, when the night come. If you walk about 700 meters from the first location (still near the beach), you’ll find fresh fish market, just arrive, brought by fisherman who sail from morning. If the weather is good, the fish prize is very cheap. One Cangkalang fish about hand size was Rp 5,000. But if the weather is not friendly, the prize is double. Believe me, when you step up to go back home, it’s feel so hard to leave that beautiful beach.